This is an A4 card that has been folded into an even gatefold. 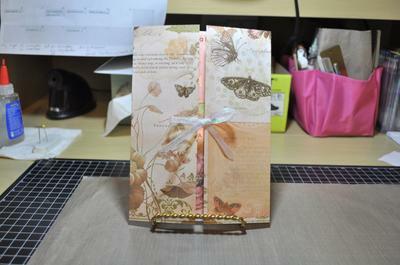 I used cardstock from the Mariposa Collection. These sheets have some beautiful embossed butterfly on them. The base card is out of this cardstock and the inside panels are also out of this cardstock just not so decorative. 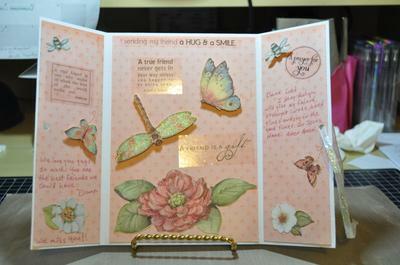 I used friendship stickers on the inside and some K & Company die cut butterfly, dragonfly, and bees. On the front I punched a hole on each side and ran a piece of white iridescent ribbon through it. I then tied a bow with the ribbon to hold the gatefolds closed. I enjoyed making this card a lot. It took me awhile to decide on just what to use. This is where I have the most trouble. I made this card for a friend who lives in another city. I do not get to see her much so I thought that this would be a nice way to say that I think of her often. She was so surprised at getting the card. She called me and said that the card was beautiful and thanked me. I only make my cards for family and friends. I also make cards for my church family. I have only been making cards for about 2 months now. I also do scrap booking which is great. I am making a scrapbook for my niece who does Rodeo and one for my dogs. Well I hope everyone likes the card and I would love to read any comments to you may have. Thanks for looking. Beautiful card and I am not surprised that your friend loved it. The colour is gorgeous and I like the way you have kept the Gatefold closed with the ribbon. I know what you mean about using your favourite paper but you know you can always scan it into your PC and store it safely, and then you will have more whenever you need it. Another alternative is to copy the original and print it out and use that. Keeping the original sheet of paper as a reference to do the same thing again in the future. Frugal crafters know all the trick. But it is so annoying when you go back to the shop for more of your favorite paper and they have sold out .... or discontinued the design that you loved so much. Hi Allie, I absolutely love everything about your card. Great job! Praying everyone has a great day. Very very pretty with all the butterflies. Nicely done. I love your creation!! The colors, the embellishments, just everything. I too, have trouble cutting up my stash of beautiful papers. But when I finally decide to, I'm happy with the results. Keep sharing your cards... it's fun to see others' ideas at work.